I always enjoy seeing that a play has a fight choreographer listed in the credits, especially when the fights involve swordplay. 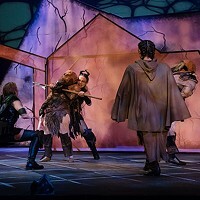 If you do, too, you’ll love Carnegie Mellon School of Drama’s The Three Musketeers, adapted by Megan Monaghan Rivas from the novel by Alexandre Dumas. This is the final production of CMU’s main-stage season, and it feels like the graduating seniors throw everything they have into it. If you’re gonna go out big, this is the show to do it with. One of the most widely adapted works from its time (as the exceptionally enlightening essay by dramaturg Dani Joseph attests), this interpretation, according to the program, “reimagines 17th century France as a place where men and women are equally entitled,” and offers some exciting gender-switching in key roles. The 14 actors play 39 parts. Victoria Pedretti is superb as Captain Tréville, as is Spenser Pollard’s Cardinal Richelieu (he could pass for Charlton Heston’s son in the 1973 film version). Siddiq Saunderson (D’Artagnan) and Mckenna Slone (Milady) are excellent, and John Way (Bonacieux) echoes Spike Milligan’s comedic portrayal of this role in the 1973 film. 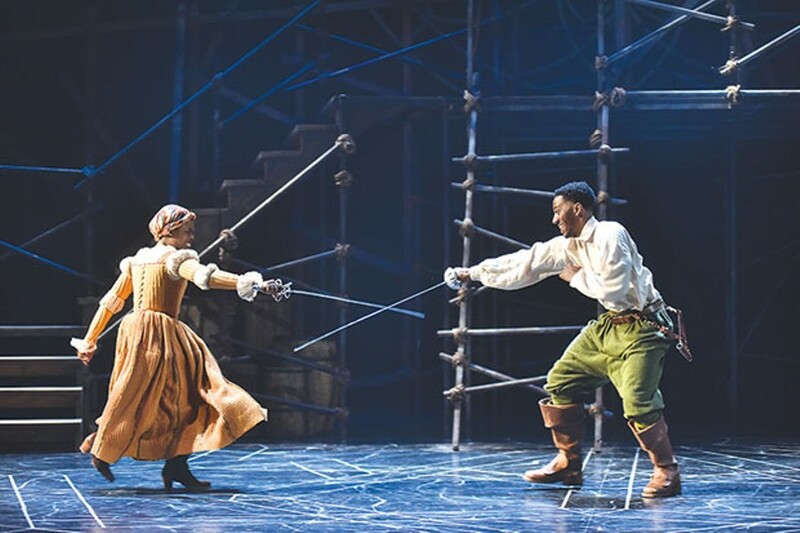 The action is thrilling, the swordplay dazzling (thanks to fight director Michael Rossmy), and Marla Parker’s costumes are sumptuous. 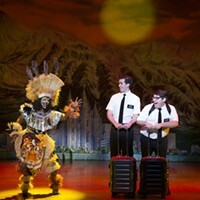 A few dropped swords and wigs led to witty ad-libs, which only enhanced the show’s exuberance. Andrew William Smith’s direction is sophisticated and daring, but during Act II, I started to feel like an overwhelmed tourist on a sightseeing bus when too many landmarks are pointed out. The onslaught of smash-cut scenes inserted to explain a multitude of plot points from the 550-page novel makes the action drag. 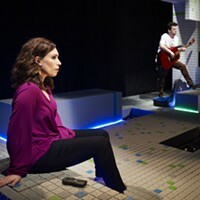 Sarah Keller’s sets manage to be simultaneously grandiose and coarse, befitting a 1625 milieu, when someone might walk into a royal palace covered with road dust and manure. Ben Vigman’s lighting effects produce moments of visual ecstasy, and the way he can slice up the stage is masterful.